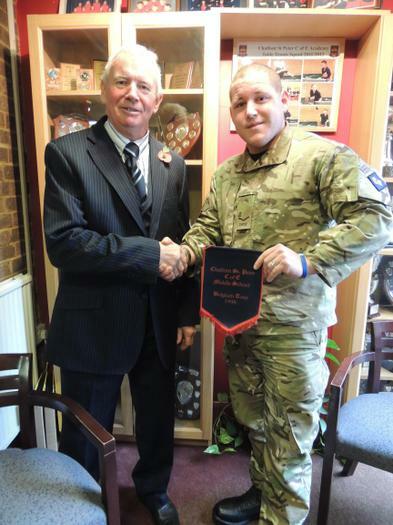 On Monday 11th November we held a Remembrance Assembly with a special visitor: past pupil Lance Corporal Tim Jones. Tim joined the army after leaving Dr Challoner's Grammar School. One of his tours was based in Afghanistan, where he was unfortunately injured. His visit to the school held the children's attention, gripped by his motivational speaking and bravery. As a past pupil, Tim enjoyed looking around the school recalling fond memories of his time here! quite a lot has changed since then. Mr Underwood presented him with a pennant from a football tour to Belgium in which he represented the school as a member of the school's football team. Each year, at the Leavers' Presentation Assembly, we present a trophy donated by Tim's family - The Jones Trophy, to a footballer who shows determination, courage and progress. I think this year, that trophy will be presented with a whole new meaning. Hopefully, Tim will return to present it.